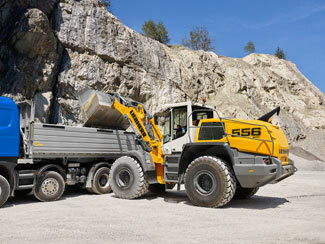 The L 556 loader has a standard 3.5 m³ bucket and a 12,850 kg tipping load. It features Liebherr´s hydrostatic translation system, which promises to reduce operating costs and maintain high productivity. "Taking advantage of the robustness of the machine and the high performance combined with the low operating costs for which Liebherr is recognized in the market, the L 556 loader was developed considering the forms of application and needs of the national market," says the press agent Tatiana Bielefeld. The product is designed to ensure greater efficiency for the customer. The ideal positioning of the engine in the transverse is only possible with the hydrostatic translation system, which eliminates the need for additional counterweight, which reduces the operating weight of the equipment, increases hourly output and still saves up to 25% on the fuel consumption. The use of high-quality hydraulic components, combined with the unique travel system, requires less engine power and allows for faster and easier filling of the hopper, resulting in shorter work cycles. Hoping for the market to recover, the spokeswoman explains that the company participates in Vitoria Stone Fair with a broad interest in its qualified public, which has the presence of the niche of land movement.